Lime has hired Dan Richter, a former Uber VP, as its chief business officer, according to the Wall Street Journal. His hiring could hint at big plans for expansions now that Uber owns the scooter startup, which appears to be on a hiring spree. Other bike and scooter startups, like Bird and Motivate, have also been on a hiring like crazy. 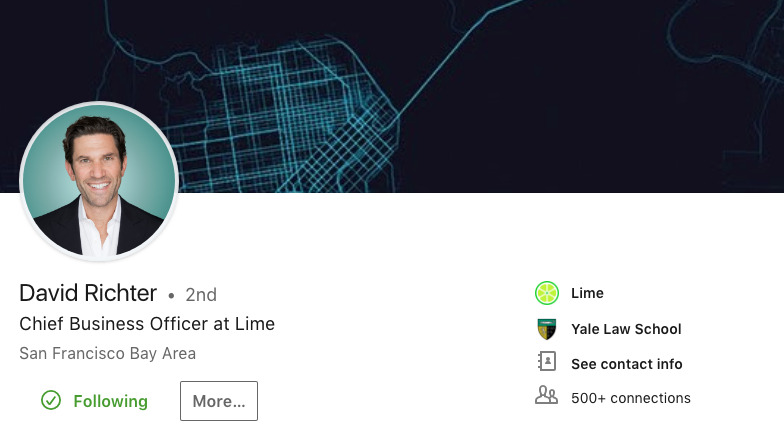 Lime has hired former Uber vice president Dan Richter as its chief business officer, the Wall Street Journal reported Tuesday. Richter will join the scooter and bike company in which his previous employer has invested heavily to oversee mergers and acquisitions, hinting at possible plans by the company for future expansion through deals. He left Uber in June to spend some time “on the beach,” according to his LinkedIn profile. The hiring spree could continue well beyond Richter, too. There are currently 280 active job postings on Lime’s website, with many published within the last week. Those openings include a community affairs manager in New York, a director of partnerships in Boston, as well as a head of government affairs in San Francisco and more. Uber customers will soon be able to book Lime scooters through the Uber app, Lime’s CEO Toby Sun told the Wall Street Journal, a move to connect modes of transit beyond car services that has become a hot topic among transportation startups – especially as they seek to transition from rogue enterprises to viable options. To help with this effort, they have been hiring up across the board. Lyft, Uber’s closest competitor in ride-hailing services, also owns Motivate – a bike-share operator with programs in New York, Washington D.C., San Francisco and other major cities. Bird, another scooter startup yet to be acquired, recently hired former New York transit advocate and non-profit executive Paul Steely White to lead safety policy and advocacy. Lime currently operates in about 100 cities in North America, Europe, and New Zealand.